When Sharon began receiving hospice services, she was depressed and didn’t understand why God wouldn’t take her. Knowing her love of music, hospice then referred her to music therapy. So I began seeing Sharon once a week in her home. At that time she was 98 years young (about three years ago) and was still living on her own but was unable to participate in any of her hobbies (singing, dancing, bowling, or playing the organ) because of her declining health. 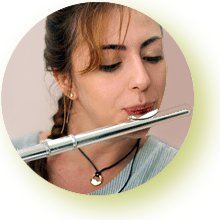 Sharon loved hearing the flute, her favorite songs, and guessing the tune. Often she would hum along or play an instrument (especially the drums). Sometimes we wrote songs and recorded her stories, and other days she just needed to talk. One day her grandson (who is a drummer) called her and she told him, “This is your djembe-playing grandma.” Sharon frequently told me the story over and over again and was so delighted at his response to her saying that. This summer Sharon had to leave her home and move into a home-care facility. Throughout this process, while it was stressful, she handled it gracefully and accepted the changes in her life. The staff saw how much she enjoyed music, and five people from her treatment team called to request that we increase her visits to twice a week. During the last couple of months, certain songs began to stick in her head and she would request them time and time again. Each song focused on a theme that related to her life, and she would ask me to read her the lyrics and then discuss the significance of the song. From the time Sharon moved into the home-care facility, the same song, “There’s a Rainbow ‘Round My Shoulder,” was stuck in her head. While we joked about it, I know that the image of keeping a rainbow wrapped around her brought her a source of comfort. It was the last song that I played for her. This morning I woke up at 4:30 having dreamed of Sharon and could not go back to sleep because she was on my mind. So I got up and started writing her chart notes from Tuesday. Later that morning on my way to work, her social worker, and my good friend, called to tell me that she died overnight. While most of my patients are not able to express their gratitude or appreciation, Sharon took the time to do this. Not one session went by without her saying, “Do you have to go? Can’t you stay all day? I look forward to this all week long. You are the highlight of my week.” Or, “Thank you, Julie. I enjoyed it so much.” Talk about rewarding! I can still hear her voice ringing in my head, “How’s my Julie? How’s my Teddy? Give him a hug for me . . . not too tight,” and she would laugh!